The Col d’Eze time trial, for many years a nailbiting finale to Paris-Nice, is set to make a reappearance in the 2012 edition, according to French sources today. The route for the Race to the Sun is not due to be unveiled for another couple of days but details have leaked out and show that the race will climax with a 9.6 kilometre solo time trial to the summit of the famous climb. Riders such as Sean Kelly, Stephen Roche and Miguel Indurain have sealed their Paris-Nice victories there in the past and its time trial reappearance after eleven years’ absence should ensure that the final outcome will be up in the air until the final day. The Col d’Eze was used between 1969 and 1995 as the finale of the race, pitting the big guns against each other in the uphill race against the truth. Nice later replaced it as the location of the final stage, but the uphill time trial reappeared in 2001 on the penultimate day. Dario Frigo (Fassa Bortolo) took the victory en route to winning the race overall. The climb has featured since, but never as a race against the clock. The details of this and other stages have been revealed by both Velochrono.fr and 21virages.free.fr/blog. They stated that the 2012 Paris-Nice will begin with a 9.4 kilometre time trial from Dampierre-en-Yvelines to Saint-Rémy-lès-Chevreuse. This will open time gaps and immediately thrust a strong rider into the leader’s jersey. 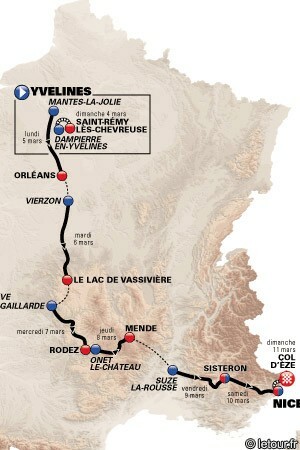 Days two and three are said to extend from Vierzon to Lac de Vassivière (194 km) and Brive-la-Gaillarde to Rodez (183 km), while the fourth stage will be a lot lumpier en route from Brive-la-Gaillarde to Rodez, a distance of 183 kilometres. The Côte de Saint-Pierre will come in the last section and includes a 500 metre section at seven percent gradient. One of the most exciting short climbs in France will then conclude day five’s 178 kilometre race from Onet-le-Château, with the montée Laurent Jalabert at Mende certain to blow things apart. It was last used in the 2010 Tour de France, where Alberto Contador (Astana) and Joaquim Rodriguez (Katusha) wrested clear and the latter took a sprint to the line. Friday March 9th will travel 176.5 kilometres from Suze-la-Rousse to Sisteron. That end town will host the start the following morning, with the longest stage awaiting the riders. The 220 kilometre race includes the Col de Vence near Nice, although it is sufficiently far from the finish for a regrouping of sorts to happen. That will help keep the gaps relatively tight before the final day concluder on the Col d’Eze. Tony Martin (HTC Highroad, now Omega Pharma Quick Step) won the race in 2011. His new Omega Pharma Quick Step team will be part of the race in March, as will the other seventeen UCI ProTeams, plus 1T4I, Cofidis, Saur-Sojasun and Europcar. They were confirmed as wildcards one week ago.